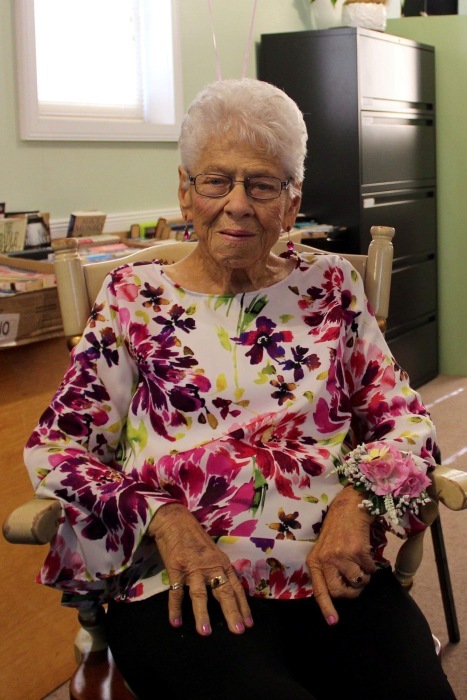 Formerly of Haley Station passed away peacefully in the Pembroke Regional Hospital on Wednesday March 27, 2019 in her 91st year. Pearl Gould nee McQuitty beloved wife of the late John (Jack) Gould. Dear mother of Isabel Tanguay, Shirley (Larry) Gilchrist, David (Lisa) Gould, Christine (Ken) Kennedy, Alice (Gary ) Perkin. Also survived by 12 grandchildren Josh, Elyse, Sean (Jackie), Jeff (Kelsie), Kayla (Dan), Katrina (Phil), Ryan (Melanie), Jesse (Rachel), Jordyn (Lindsay), Michelle (Raj), Brandyn (Angel), Marnie (Mike); 18 great-grandchildren Kaeli, Logan, Kase, Ash, Isla, Hailey, Harmony, Rowan, Jaime, Jaxon, Gavin, Ethan, Lilyanna, Elijah, Jacob, Audree, Abbigail, Aspen. Predeceased by a son-in-law Wayne Tanguay, great-grandson Kegan Gould and a sister Gertrude Early. Friends may call at the Fraser-Morris and Heubner Funeral Home Cobden, Friday March 29, 2019 from 2 – 4 and 6:30 – 8:30 pm. Service in the Haley United Church, Haley Station Saturday at 11am. Spring interment Haley Cemetery. As expressions of sympathy donations to Haley United Church Memorial Fund would be appreciated.